Bay Of Quinte Fall walleye. I Have been fishing the Bay for some time now and I have done a lot of research on walleye and their Habits over the years. What I have found is this. There seem to be 2 definitive groups of walleye here in the Bay. I have spoken about this before and other reputable Anglers have spoken to this topic so I thought I would speak about my own findings. 1st the Resident walleye, These walleye stay in the Bay all year round you can catch them from walleye opening weekend in May right through to the end of the ice fishing season at the end of February. These walleye tend to stay in their own areas of the bay and do not venture very far. they may move as far as across the bay on windy days when there are plenty of smaller fish to feed on such as the shad or Perch when they enter the bay to spawn at various times during the season. The reason I believe that these fish do not venture too far is for the simple fact that they are lazy and that there is really no need for them to expend energy and go anywhere. there are plenty of feeding fish such as perch in these areas all year-long and there are a variety of fish throughout the year constantly coming in and out of the Bay creating a rather large buffet for these resident fish. 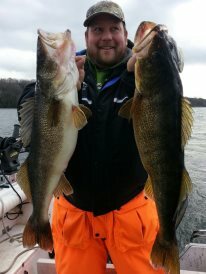 Here is how to catch these kinds of walleye. you will need to follow the bait fish to their habitats, where there is perch there is Walleye. Perch are a bottom and close to weeds type of fish so that is where you need to put your baits. I have found when the Walleye are primarily feeding on perch you will find that they will be close to weed edges and right tight to bottom. also I find that these types of walleye tend to have their feast in 10FOW and less. If the walleye are feeding on Alewives, or shad you will see large bait balls suspended in the water column, you will need to get your baits just under the bait balls as the walleye feed in an upward motion and will hit your bait first if it comes across it before it reaches the bait ball. If you find a baitball and see a few big hooks on one side mark this on your finder and position your boat on the far side of the bait ball. try putting on a 1/8 ounce jig and twister tail and cast over the bait ball to where you marked those hooks, if you can entice a strike then don’t leave the area where there is one there are potentially more feeding on the same meal. 2nd is the Migrating Walleye, These Walleye Tend to enter the Bay through the Adolphus Reach and the Trent canal from the open waters of Lake Ontario. they start entering generally in late September to mid October and as the weather and water temperatures get colder the better the fishing gets as the more fish enter into the Bay. However unlike their cousins (the resident walleye) these fish seem to react based on what their Buffet is doing. As the cooler weather approaches the Shad and Alewives head into the Bay Of Quinte to Spawn and as we start to see mass amounts of large bait balls throughout the Bay following close behind are the massive trophy Eye’s that everybody comes from all over to find. These fish spend all winter feeding on the bait fish and getting fat so they have the energy to create their eggs and spawn in the spring just after the ice breaks up and leaves in the spring. During the Fall popular areas these Walleye can be found are throughout Adolphus Reach, Picton Harbour, Longreach, and into Hay Bay. Typically these are a deeper water fish and spend their time in cooler temperature water, therefore generally speaking you would want to change-up your presentations to a deeper diving crank bait when fishing for these migratory fish. There are so many different types of crank baits on the market today I can’t really get into them all, in fact I couldn’t even if I wanted to as I am learning about new and older baits every day it seems, some I have never heard of or tried. It will take a bit of time and or effort to figure out what works for your style of fishing but when you find what works for you the time and effort you’ve put in will pay out with fish of a life time. The one thing to remember it seems is, no matter what time of year it is, if you want to find the Walleye then all you have to do is find the bait fish. Don’t forget to like my FaceBook Page just hit the like button at the sidebar of this page. Awesome write up. You make it sound easy (understanding the fish) but we all know it’s never “easy”. Everyday, every turn another variable. Still, I love the hunt and trying to figure out the puzzle. Coming up in a few weeks to try my hand at “the puzzle”. Good luck Capt! Thanks for the reply. yes it is tougher than maybe I made it seem in the article, I did not mention that I put over 150 day’s on the bay each year to find these fish, and each year is a bit different. However the principals are the same each year and once you find a pattern that works it does tend to get a bit easier over time LOL. Anyway good luck on your visit I hope you get a beauty.